I’ve noticed they have been talking about Paul a lot recently (and not positively). It seems like the « Mafiafrique* » doesn’t want him anymore. What was whispered 15 years ago in the streets in Bukavu has started to be revealed to the international public opinion. We are close to know the names of the big guys? By the way, Congolese Tutsi or Hutu tribes don’t exist in the Eastern Congo. Several years ago, Mobutu was so kind to open Zaïre borders to welcome Rwandan refugees (twice) while the other neighbors closed their borders. When democratic governments choose to ignore human rights abuses committed by an autocrat they support, it is normally in the name of national security or shared economic interests. But in the case of Rwanda’s authoritarian president, Paul Kagame, the overwhelming rationale is guilt. The world stood by in 1994 as factions of Rwanda’s then army, their allied militia and Hutu civilians shot or hacked to death an estimated 800,000 Tutsis and moderate Hutus. While the UN dithered, Kagame – commander of a Tutsi-led rebel army – accelerated his military campaign and crushed the murderous regime and militia, some of whom fled into eastern Congo. 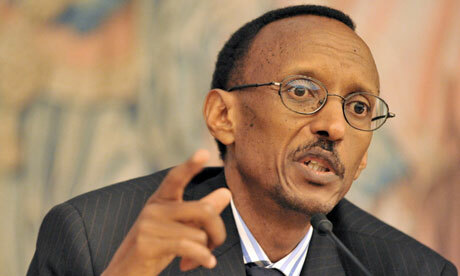 In 2000, he took office as president, vowing to rebuild Rwanda. Since then, his government has won international praise for its effective use of development aid, while the man himself has drawn endorsements from the likes of Tony Blair and Bill Clinton. Even with a third of government revenues still accounted for by aid money, donor governments have been quick to describe Rwanda as an economic miracle. Nobody can deny that it has made significant progress on state reconstruction. But donors have until now routinely played down Rwanda’s backing for Congolese Tutsi rebels who have committed serious human rights abuses in eastern Congo over the last 15 years and who are a major destabilising force in the Great Lakes region of Africa. Rwanda’s friends argue that its intervention in Congo is partly justified as it needs to defend itself from the FDLR, the Congo-based Hutu rebel group that is partly made up of those who committed the Rwanda genocide and now commits regular abuses against Congolese civilians. However, Rwanda’s interests in eastern Congo run deeper than this, notably guaranteeing Tutsi businessmen and military figures access to valuable Congolese grazing land and mineral production, large quantities of which have been smuggled through Rwanda to the outside world. In June UN investigators on Congo published a note to the UN security council providing detailed evidence of Rwandan military support to Congolese Tutsi rebels who mutinied from Congo’s army earlier this year. Kagame’s government has hotly denied the findings. In the past few days Britain, the US and a number of European governments have frozen symbolic amounts of aid as diplomatic patience wears thin. This is not the first time Rwanda’s behaviour in Congo has come under the spotlight. A 2002 UN investigation into the illegal exploitation of Congolese resources fingered Rwanda for its role in looting minerals during the civil war. In 2008 a UN investigation team I was a part of unearthed evidence of Rwandan support to Congolese rebels who were responsible for gross human rights violations and led by the Tutsi warlord Laurent Nkunda. After the 2008 report some donors cut aid but relations normalised after Rwanda arrested Nkunda and instructed his deputy, Bosco Ntaganda – who is wanted by the international criminal court — to integrate rebel forces into the Congolese army. That peace deal was billed as a success by diplomats at the security council. At the time, I warned that it represented nothing more than “a period of incubation for a renewed crisis to come”. Indeed, the integration of Ntaganda’s men proved disastrous as they used the cover of military operations against the FDLR to set up lucrative taxation rackets and seize valuable mineral-rich territory. In so doing they entrenched themselves as a private army for Tutsi business interests while committing numerous human rights abuses in Congolese military uniform. Ntaganda’s mutiny in April removed any remaining justification Rwanda could have for supporting his troops. The latest UN findings call into question Rwanda’s bid to win a seat at the security council later this year. But even leaving aside these findings, human rights groups have been steadily sounding the alarm on the increasing levels of authoritarianism developing under Kagame’s presidency, as the regime has intensified its crackdown on its critics by arresting and intimidating opposition politicians and journalists. Bellicose statements by high-ranking regime defectors, meanwhile, underline just how fragile Rwanda’s political system is, in spite of notions that Kagame has united the country. Rwanda is a traumatised society. It needs real help, not blind aid. Donors should consider how they spend their money, or they may end up feeling guilty again.